First posted here at Digitally Downloaded. Ubisoft welcomes you back to the insane Rabbid-inhabited world known as Mario + Rabbids: Kingdom Battle with the new Donkey Kong Adventure expansion. This self-contained story is entirely separate from that of the main game with a range new weapons, enemies and some familiar faces. 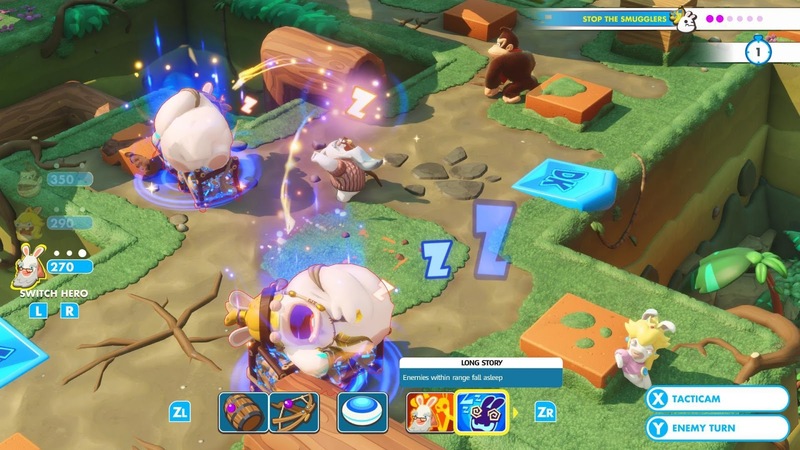 You can tell that the developers took the time to recreate what made Mario + Rabbids: Kingdom Battle a unique experience when it released last year, but even with the inclusion of Donkey Kong it often feels largely more of the same. The story is just as humorous as ever. Offering up a bizarre new story that could only work in the Rabbid universe. Rabbid Peach and Beep-O are returning characters who are accidentally transported to a different dimension via a malfunctioning washing machine, where they meet their new companions – Donkey Kong and Rabbid Cranky. You soon discover that Rabbid Kong is running amok in this dimension and it’s up to you to knock him down a peg and restore order to this unusual world. The gameplay still retains the same strategic elements of the base game, but it has shifted to feel based solely on Donkey Kong and the abilities that he possesses as opposed relying on all three characters. (Although Rabbid Peach’s healing abilities do come in useful on occasion). Each level feels like it is designed solely for Donkey Kong in mind. There are numerous Donkey Kong exclusive jump pads scattered around each level that allow him to move across the levels at ease. Donkey Kong can also climb up the terrain without the use of jumping on another team member or using a pipe. Donkey Kong himself has numerous abilities that make him seemingly undefeatable in combat, or at least by the time I finished the game I never had him die once. He can throw team members across the level – useful for approaching and avoiding enemies. This can also be used to throw enemies out of bounds. Another level design choice that is obviously inspired by Donkey Kong is the fact that he can pick up blocks off the map and throw them at enemies – useful when the blocks have effects such as honey or bounce. On top of this his weapon is a boomerang that allows you to hit multiple targets at once, and he has a special ability where he plays the bongos and nearby enemies are drawn to him. Coupling this with his ground pound attack means that you can make short work of enemies in no time. Rabbid Cranky is the second new character in Donkey Kong Adventure who also provides some fun, new abilities to the party. Most of Cranky’s moves provide a lot of area-of-effect damage as his two weapons are a shotgun and a grenade. When he is thrown around he can also shoot downwards upon landing allowing for additional damage. His special move allows him to put all nearby enemies to sleep as he rambles on and on. This is useful when enemies are too close to either your team members or the finish line in certain levels. The levels are enjoyable and it’s satisfying to see Donkey Kong swing between platforms at ease. However, the fact that you are stuck using these three characters as opposed to a range of characters means that replayability is limited as other than changing your equipped weapons; your strategy of choice each level will be the same. Donkey Kong Adventure boasts around twenty minutes of new cinematics which are just as stunning as in the original which despite being longer only had a similar length of cinematics. The game moves at a fast pace as once you find yourself in Donkey Kong’s world you immediately make your way through the levels. The four worlds feel shorter than the main game and each is also more limited in that it contains a solitary boss as opposed to a mid and end boss. The main scenario took around eight hours of playtime to complete but there are optional puzzles scattered along your path that will add to your playtime. This mainly consists of block pushing puzzles but there are also a few others including ones that test your memory skills. There are also collectables scattered throughout the world just like in the original game. Post-game you can also compete in additional challenges that really make the DLC seem beefy. For better or worse the difficulty level in the DLC never comes close to that of the base game. As the levels tend to be based around the abilities that Donkey Kong possesses; the strategy that leads to victory is obviously quite apparent. Donkey Kong Adventure feels like it would naturally sit between the second and third worlds of the main game regarding its difficulty. While players that have already mastered the tactics formula might find this disappointing, it does mean that most veterans of the Mario + Rabbids world, as well as newcomers, will be able to enjoy this zany experience. Overall, Donkey Kong Adventure feels like a lick of fresh paint on the same experiences that were provided during Mario + Rabbids: Kingdom Battle. Whilst the inclusion of Donkey Kong changes the way that you strategise; Donkey Kong Adventure is rather predictable and I did get fatigued with it by the second world. It also would have been nice to see more done with the character himself. The developers did a great job designing abilities for him that match the Donkey Kong we all know and love, but otherwise his personality is very muted. 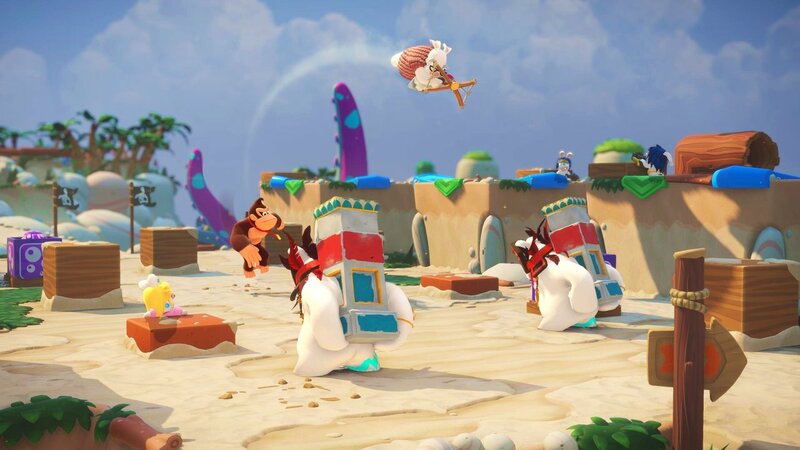 He always seems to be pushed aside for the crazy yet predictable antics of the Rabbids, which is rather disappointing for an expansion titled Donkey Kong Adventure. ← Console Challenge Day 23: Top 7 best PlayStation 3 games!